What Is An Outbound Sales Process? An outbound sales process is an accumulation of stages that sales managers implement in order to streamline the sales stages. An outbound sales process can quickly help deliver new customers for your business, as long as you do it correctly. Put simply, having an outbound sales process will enable you to get in touch with customers who have not yet heard about the great product or service you are selling. Most of us have had annoying experiences with cold calling in the past, and for this reason, many companies still shy away from developing a proper outbound sales process. This is a shame because if handled correctly customers can actually be grateful that you have drawn an opportunity to their attention. Of course, you do not want to annoy anyone, but as long as you follow a few key steps this should not be the case, and you should see your customer base expand pretty quickly. This is the first, and arguably the most important, step in any outbound sales process. Too many people think that sending out as many emails as they can is going to be effective – trust me, it isn’t! What you need is a list of prospective customers who are actually going to be interested in your product, and critically have the money and power to make a purchase. This is what we do at CloudLead. We take care of your lead research so you can focus on the rest of the process. However, what is important to know is that this process may indeed be the cornerstone of your outbound sales process but caution is necessary. The reason for this is that you need to know who your ideal customer profile(ICP) is and without a clear definition of your ICP you may find yourself going around in a loop. Ask yourself, “how you can write amazing targeted content” without knowing who your ideal buyer is and furthermore as you invest in B2B contact data you will realize that data hygiene and enrichment is important. How you contact your customers is up to you, of course, but I normally recommend using email. In today’s business environment, calling busy customers is likely to annoy them – send an email, and when they have a spare moment they will see it. As long, that is, as it looks interesting. Make sure that the benefit of your product is in the title of the email, and that you keep the mail itself short and to the point. Read How to send cold emails that convert for this type of email, and you won’t go far wrong. Make sure you have planned in time to follow-up with customers. 80% of sales require 5 follow-ups just to close a meeting. Don’t think that because someone is not answering right away it means that they are not interested. Most of the time they are just very busy and keep delaying getting back to you. You should have a good demonstration of your product or free sample ready to go at any time. This way, you can hopefully show them precisely how your product can improve their business. Once you have a few potential customers, it is time to close in a get the deal. At this stage, bear in mind that everybody’s needs are different and that your customer might have some questions and concerns that you have never thought of. Make sure that, in all of your dealings with the customer, you take time to listen to them – they will feel that they are a valued customer, and be more likely to purchase your product. Another critical aspect of this step is to make it easy for your customers to buy, or to sign-up, with your company. There is nothing that destroys a customer’s excitement like filling in dozens of forms. Make sure your process is streamlined, and you should have no problems here. Great, you’ve now got a load of new customers, and so you may think your work is done. Wrong – it is just beginning. Make sure you support your new customers through the adoption process and be there when they have questions. Doing this will ultimately mean that they recommend you to their friends, which is a win-win situation for you both. 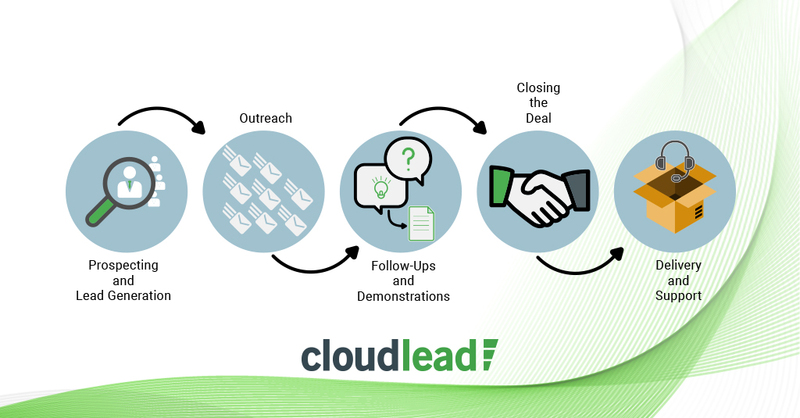 Contact CloudLead here for more information.